Thank you very much. I’ll start digesting this straight away and see how I get on. I’ll need to watch a few more of your tutorial videos first. Your support has been magnificent; I can’t thank you enough. Here are your manufacturing stair files. -a PDF folder with a workshop document that contains the general plans and cutting list, and a PDF file for each part that can be printed out full size. When using the full-sized templates, note that I have marked a StairDesigner error on the second newel post and the second left string. 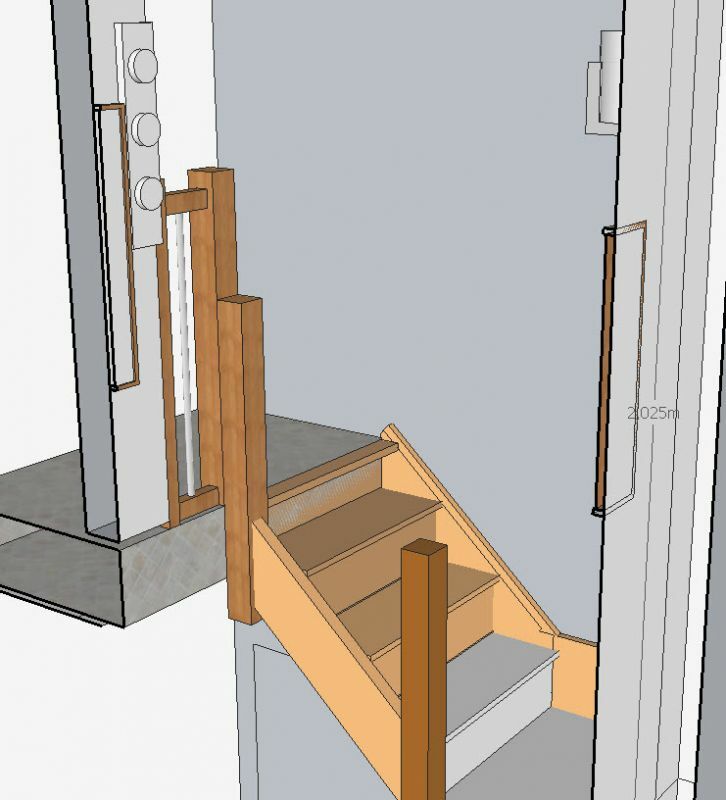 This is because Stair Designer has a tendency of miscalculating the risers on winders around the newel posts, and extending the riser housing into the following string, even when it should stop at the newel post. This creates an extra housing marked on the second string and on the second newel post. You just have to ignore this marking. 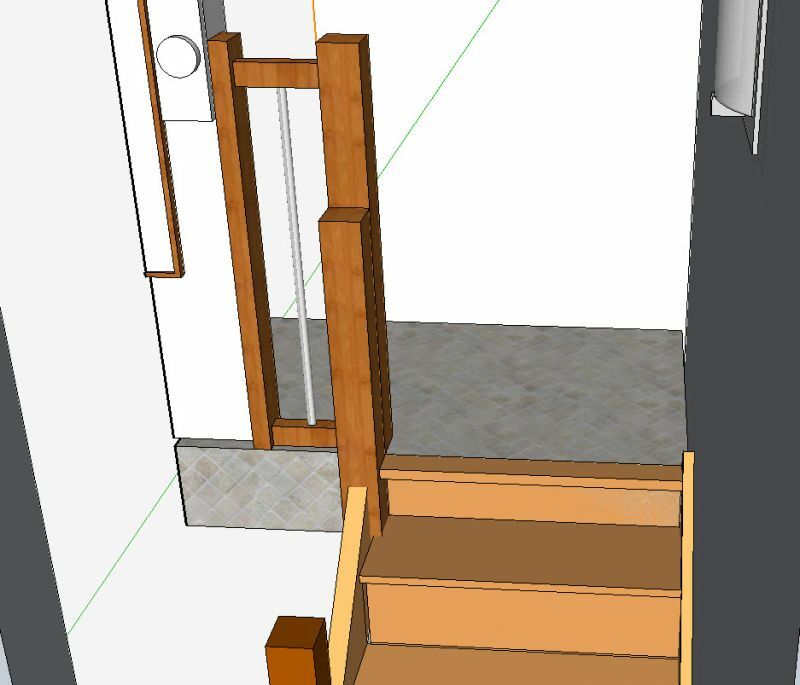 Also included in the compressed file is the AutoCAD sketch that I made of the stairwell and the SketchUp model into which I have inserted 3-D model from StairDesigner. Hope this is all clear, and that all will go well building the stair. Don’t hesitate to get back to me if you have any questions or problems. Keep us updated on how the project moves forward. Everything looks fine. Please go ahead. Yes, the post parameter “position reference”refers to the back face of post. I didn’t mention the changes you made on the last flight, but I did look at the changes and tweaked a bit position of the last post and step (only one millimetre). Otherwise it all seemed to line up perfectly, but could you give it a last check the sds file and AutoCad drawing just to make sure that it’s OK. 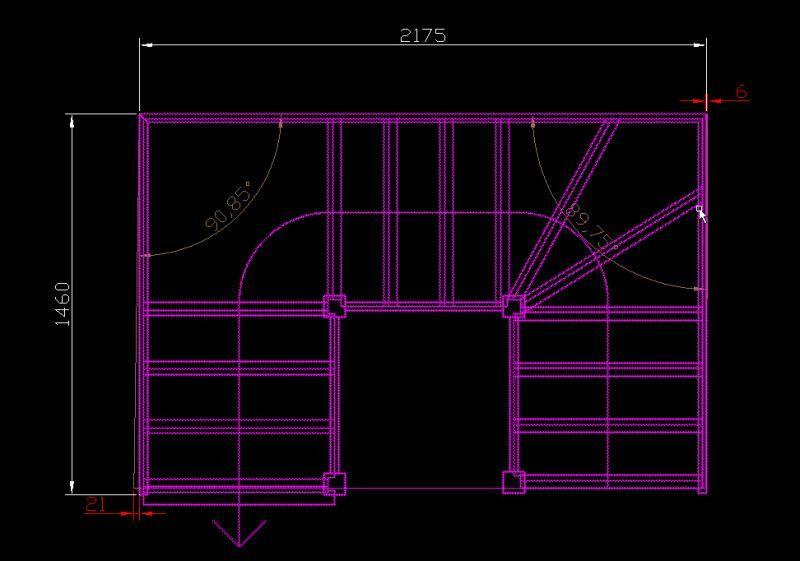 In the image of the AutoCAD drawing all the dimensions are marked. If it’s all okay I’ll go ahead and send you the manufacturing files tomorrow. I also thought about rounding the first two steps but couldn’t implement it with Stair Shaping function of StairDesigner, so I didn’t mention it. From what I see from the newel parameters for the first post, I take it that the position reference relates to the back edge of the post, i.e. where it meets the string. Am I correct? You didn’t mention anything about the changes I made at the end of the top flight (see my posts of 4:33pm and 5:13pm yesterday). If those changes are ok, please go ahead with the manufacturing drawings. I’ve setback, the first post so that it’s axis is at 406 mm from the first step. This should make it possible to connect the first floor landing handrail to the newel post. The best way to make the firsts to steps, would be to make them without any stringer on the left-hand side, and sitting on a couple of boxed riser. I illustrate the idea in the AutoCAD drawing and the quick sketch up model I’m attaching to this post. Of course the two step ends don’t have to be rounded, but I consider this a more elegant start of the stair. Of course, you can make the ends of the steps square or just with the angle cut off, which makes building 1st two steps and rises easier. Details of these two box rises should the setup in CAD using the 2-D DXF file. You can also set them up directly on the printed plan that you get when you print the full size plan in the PDF file. Tell me if this is okay for you and I’ll send you the working documents. The detail I remembered concerns the position of the first newel post. This needs to be moved back to line up with an existing handrail on the first floor landing, i.e. our starting level. http://screencast.com/t/MTJHE12sJ That handrail runs parallel to the wall adjacent to our second flight. The centre line of the handrail is 1030mm from that wall, i.e. 406mm from our starting point, given that the length of our first flight is 1436mm. In v07 I have moved the newel back, but I’m not sure whether I’ve positioned it quite correctly. Perhaps you could check this for me? Could you also advise me about what you would do with the first two steps, i.e. the steps in front of the newel. Would you just box off the left-hand side with an overhanging tread? Oops, hang on Ness. I’ve just thought about another little detail. Please wait for my next post before you do anything. Sorry, making that last change I asked for was easier than I imagined. I’ve implemented it myself. Would you please just check it over and, if you think it is correct, go ahead with the manufacturing files. Wow, that was nice to hear. Made staying up late worthwhile. I’m virtually ready for the manufacturing files. If I leave it as it is at the moment, the third flight will fall a bit short of the loft entrance I’m aiming at, because I ‘artificially’ shortened that flight to get consistent treads. Obviously I could make the top tread longer to meet up with the loft entrance, but I would like the strings to go right to the loft in one piece, if I can, rather than having to insert a horizontal bit at the end. Could you please just adjust the third flight so that it still has treads of 225mm, but also a small bit of landing at the end to bring the total length back to 1460mm. (I can’t work out how to do this, I’m afraid.) That way, I presume the strings will reach right to the loft entrance. Yes, your solution seems to work quite well. Checking your model, you seem to have all steps to as you want them at 225 mm. Well done, this is a nice elegant solution. In the attached model I have just tweaked a bit the first left-hand string so that all the steps are correctly housed into it, but otherwise your model works well, and leaves a maximum passage on the landing. Would you like me to go ahead and make you the manufacturing files? I don’t think I can make the exit off the landing that narrow. After all, there are still the two odd steps to build off to the right at that point, if you recall. You can see what I mean in this Sketchup image: http://screencast.com/t/CpM0siE6awQ. What do you think of the solution I’ve attached below? It’s basically your v02 revision but with the stair width reduced from 755mm to 720mm. If I’ve done the modifications correctly, this gives us the required tread of 225mm (hence 42 degrees), and only reduces the landing width to 757mm. I’ve also shortened the third flight slightly to make those treads the size as those on the first two flights. It’s a pity that you can’t move the stair forwards, and I don’t think it would be a good idea to create an angled first step, as the angle would probably be in the wrong direction and the first step would still get in the way of the door. The only other way I can see of getting the right slope would be to diminish the landing. If the landing step was angled slightly, this would just be enough to enable us to make the steps with a 225 mm going. Unfortunately this configuration diminishes the opening of the stairwell to the “attic” on the right hand side. 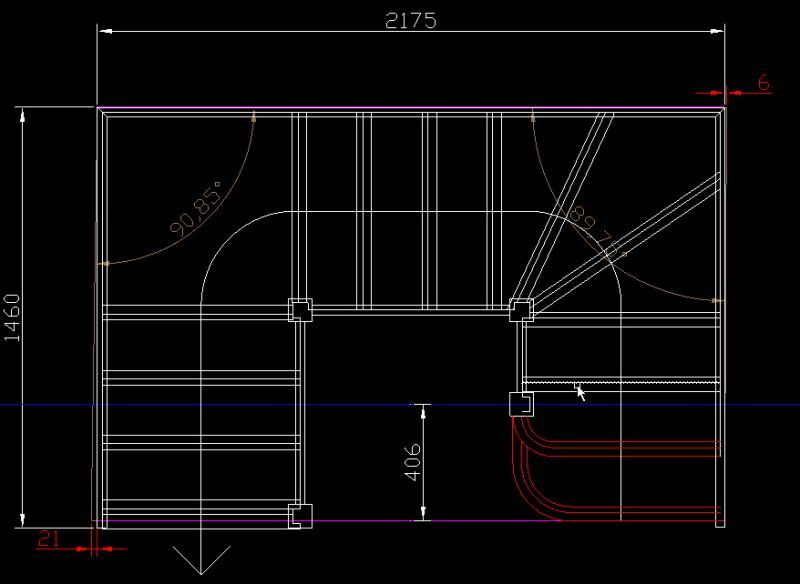 We can increase slightly this opening by making the landings step curved as in the attached screen capture of the AutoCAD drawing that I am sending. If necessary, we could even open up the landing to the right a little bit more by making the preceding steps curved, but this requires a lot of extra work on the stair and probably wouldn’t be economically viable. I attach the stair designer model with the landing step angled to increase the tread line and the AutoCAD drawing with this landing step curved to increase the opening to the right. If 664 mm of landing to the right is enough to get into your attic, this could be a good solution. Sorry to hear about your finger. I don’t know how you manage to fit in all your work as it is, without added problems. Bringing the first step forward also has the benefit of increasing headroom below this stair, but I’m afraid it just wouldn’t look acceptable. In this photo, http://screencast.com/t/dzpvTrlBXjSd, you can see the region where the stair begins. The original length we used for the first flight was based on starting the stair slightly past the architrave of the door marked ‘MILLI’, i.e. very slightly inside the door opening. Your new length of 1550mm would take us 125mm into the door opening. The door opening is only 668mm to begin with. Do you think that making a winder of the first step would help make it look acceptable? Is there any other way to achieve the 42 degrees, maybe by making the steps even narrower than they already are? My fingers are so crossed they’re almost breaking. Oops, sorry. Sorry to get back so late, but I’ve actually broke my finger in the workshop, so I have been running back and forwards from hospital to physiotherapists all week and time has gone by without me even realising it. For your problem with the slope angle of the stairs, the best way to correct it, would be to move the first step forwards, so increasing the tread-line and decreasing the angle. The amount that we could move it forward will depend on the space you have around the start of the stair and the headroom. In the attached example, I have moved the stair forward by 12 cm. This has enabled to make the going around 225 mm. Is there anyway to move the start of the stair forwards by 12 cm? The only concern I still have is what I mentioned in point 9 of my post on 16 August. The gradient on the first 2 flights is currently 43.3 degrees. I’m not sure what tolerance is allowed on this but to meet the allowed gradient of 42 degrees the tread width would need to be 225mm. Are there any parameters we could still alter that would make this stair compliant? Here is your stair set up with strings 271×32 mm and the posts adjusted to 82 x 82 mm. The last post is butted up against the first floor joist, so you should be able to insert a second post against it with some railing going up to the cutback first floor partition. You might have to check the handrail heights, according to the real length of the pre-manufactured spindles and the string capping as well as the exact section of the handrails. But you can adjust these on-the-fly when you’re installing the handrail. If you buy ready planed timber you should be able to build these stairs quite easily with full size templates and the tools that you have at hand. I’m sorry to say that I can’t give you a real excuse to buy a bandsaw, but if you want me to think up one I’ll be happy to oblige since I’m not paying for it. Can you check over the project and tell me if you would like me to go ahead with processing the manufacturing files? The stairparts system I would like to use is the Axxys Origin range (in oak). These parts sit on Axxys Evolution newel bases, which are 82mm square section and available in various lengths. The main items of equipment I have at my disposal are a Festool router (1400), Festool circular saw with guide, a DeWalt mitre/bevel/rip flip saw, a jigsaw, various drills, a thicknesser/planer, a Mirka orbital sander and a dowelling jig. I don’t have a bandsaw at present, but I’m always on the lookout for an excuse to get one! If there are any questions I’ve left unanswered, please let me know. I like the idea of widening the final landing, even though it’s only a week or so since I finished plastering and painting that partition! Never mind, it’s not a major operation to change it. I’ve included an updated Sketchup view showing the widened landing and a bit more detail of the eventual roof shape and door positions. There’s no particular limit to how wide I can make that landing – it just means a corresponding reduction in in-built cupboard space in the loft bedroom. I’ve shown the opening at (randomly) 1037mm. With regard to the squareness-of-the-walls issue, I’d like to follow your recommendation about building the stair square with some play. I was hoping to be able to work with rather less play than you suggested so, to begin with, I re-measured the angles using the full lengths of the walls. This time I measured: flight 1 to 2: 89.4 degrees, flight 2 to 3: 89.8 degrees. Obviously, if any of the flights has/have to run out of parallel with their respective wall(s), it needs to be the shorter flights, i.e. 1 and 3, so that the amount of run-out is less. That means it will be flight 2 that is fixed directly to its wall over its full length and, because of the 89.4 and 89.8 degree wall angles to flights 1 and 3, these flights will need a gap at the corners of the walls of about 15mm and 5 mm respectively (given their length of 1436mm), if they are to be built at right angles to each other. (This is so hard to make clear without diagrams.) In other words, flight 2 needs to be built (15+5=) 20mm shorter than the measured length of that wall, or, to be on the safe side, 25mm shorter. Which is exactly what you suggested in the first place! Amazing. Incidentally, my new, more accurate measurement for the length of wall 2 is 2202mm (previously 2175mm). It varies with ‘altitude’. So, after taking off the 25mm to allow for the wonky angles, we’re pretty much back where we started. Also, I have to revise the length of flight 3 to 1460mm (previously 1436mm). And now to your question about material thicknesses. The biggest I can get without having it machined specially is ex 275x38mm, which means about 271x32mm. Can we manage with this? Can we lose the little stub of step at the final landing to reduce the gradient of flight 3? Thanks for posting this project on the forum. I’m sure that the process of setting up the design of this stair project will be of interest to lots of people who have to design more complex stairs. 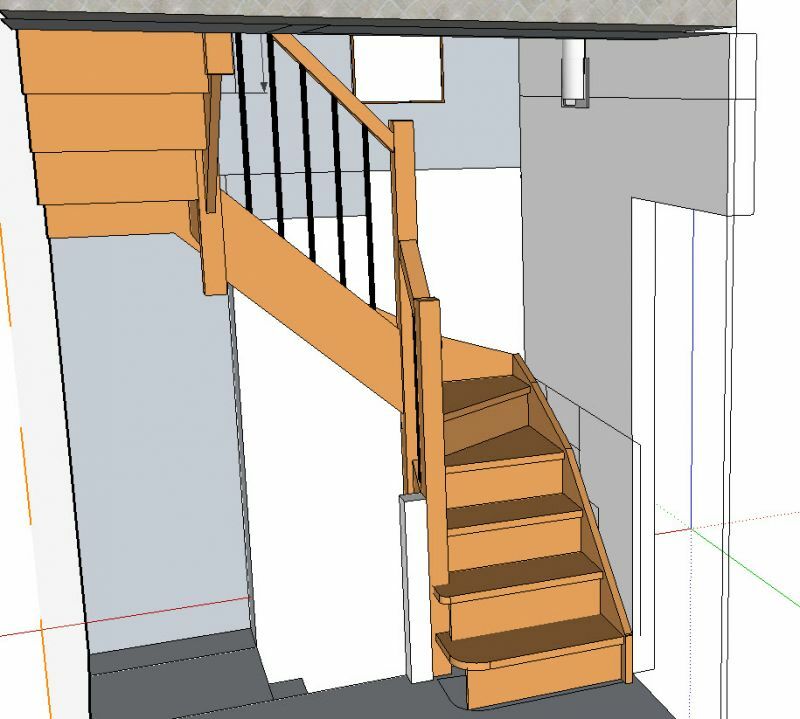 Stair projects are often quite complexed and reading about different projects and solutions to different problems is very enriching for anybody who has to tackle a stair project of their own. The stair should be self-supporting and will not necessarily need the posts to rest on the floor, so there will be no problem to have the posts hanging. For the stepped back wall you might find it easier to make the stair stringer up against the upper wall and simply add a filler on the underside of the string to fill the gap to the lower wall. Like this, the string doesn’t have to be particularly thick or doubled up. For the stairwell angles that are not 90° I have made a quick drawing In CAD and with the stairwell dimensions that you have given, it’s possible to build the stair square with approximately 20 mm play. I would suggest that you build the stair square, which makes it much easier to build, at 25 mm less than the total stair well width. Any gaps could be filled afterwards with a moulded filler pinned to the upper and lower edges of the strings. For the arrival of the stair to the first floor my preference would be to open the wall so that a short handrail return can be inserted between the newel post and the partition wall. This will open up stair well on the upper floor and create a less confined impression than the wall up against the stair post would give. I attach a modified sketchup drawing to show you what I mean.